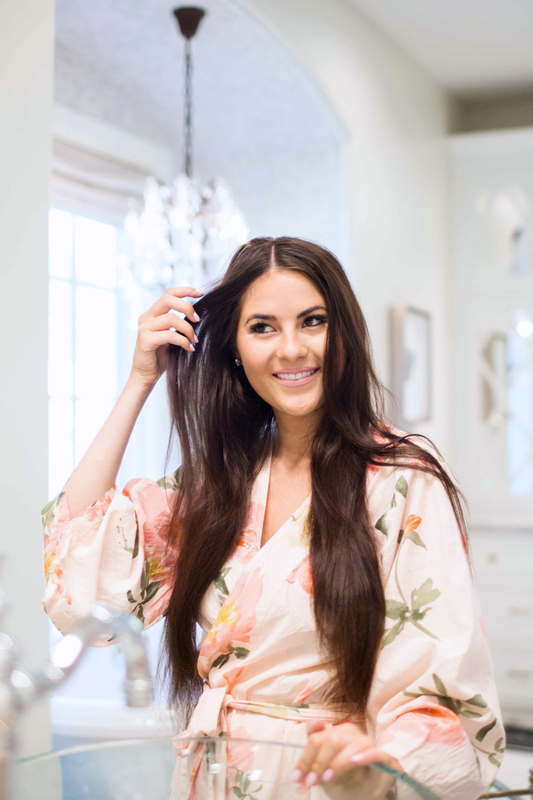 I always get a lot of questions about how I style my hair, so today I’m teaming up with Fromm to show you how I blow out my locks to get loose waves with lots of volume! I start by sectioning my hair into layers. Then I grab my 1907 by Fromm Square Thermal Brush (medium size). 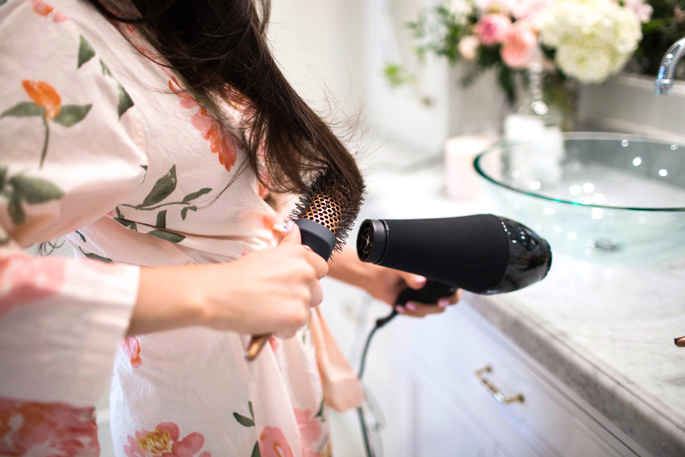 Using my 1907 by Fromm Zero7 Air Lightweight Dryer, I add heat to the brush to create a soft yet subtle curl at my ends. What I love most about the 1907 by Fromm brushes is that they have a unique shape to them as opposed to a traditional round brush. 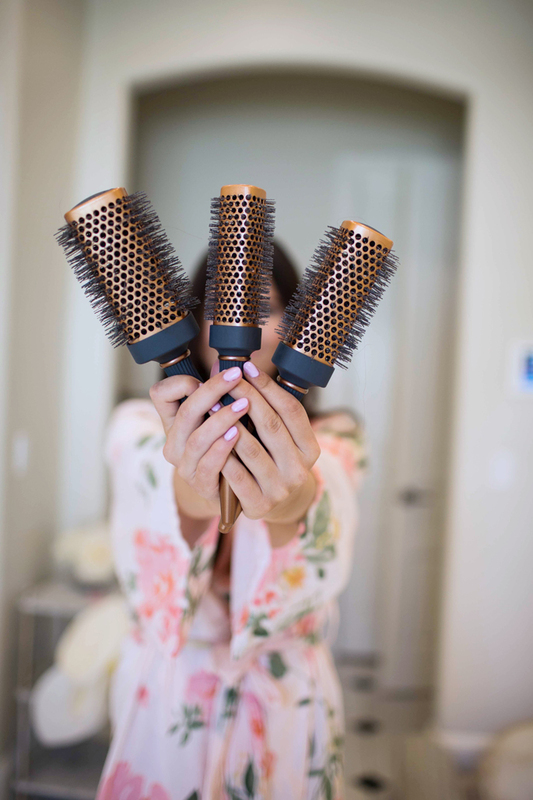 It’s easy to master three different styles using the same brush: simply straighten, create loose waves, or even form tight curls!! 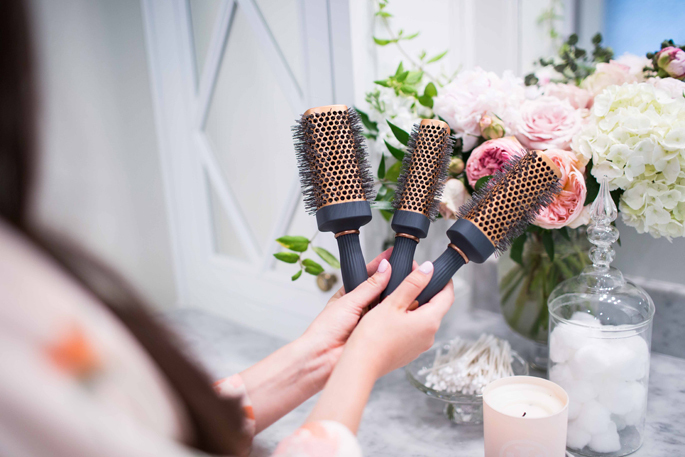 These brushes are my go-to when I’m wanting to create the perfect blow-out myself without going into the salon. Brought to you by Fromm. 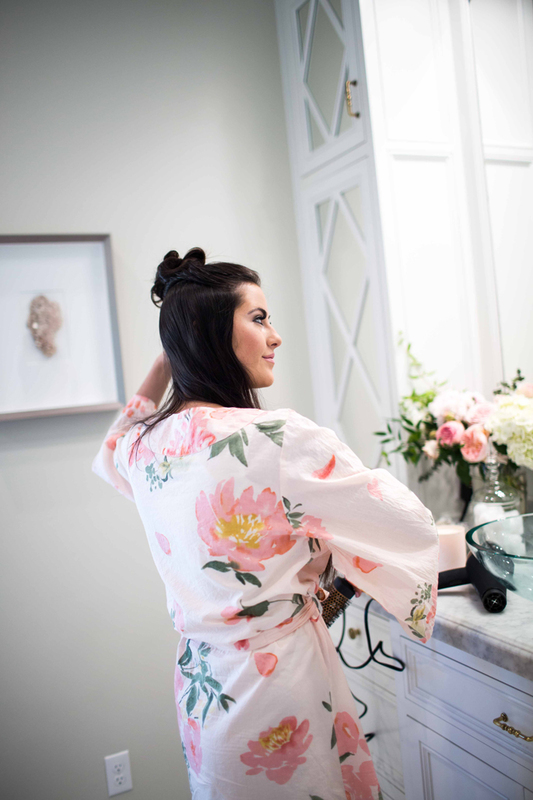 Such a pretty robe! With my thin hair, I always need tips on how to add volume. I’ll have to give this technique a try! You always have the most incredible hair! You look beautiful, and that bathroom is stunning! Beautiful! Your hair is absolutely stunning! Great tutorial! You’re so beautiful, it’s crazy! Love it!! You did such an amazing job and your pictures are perfect. I get so tired/bored about half way through blow drying my hair, but having the right materials/products really makes the difference! Those brushes look great! I will have to buy those! I am loving this robe! So pretty! 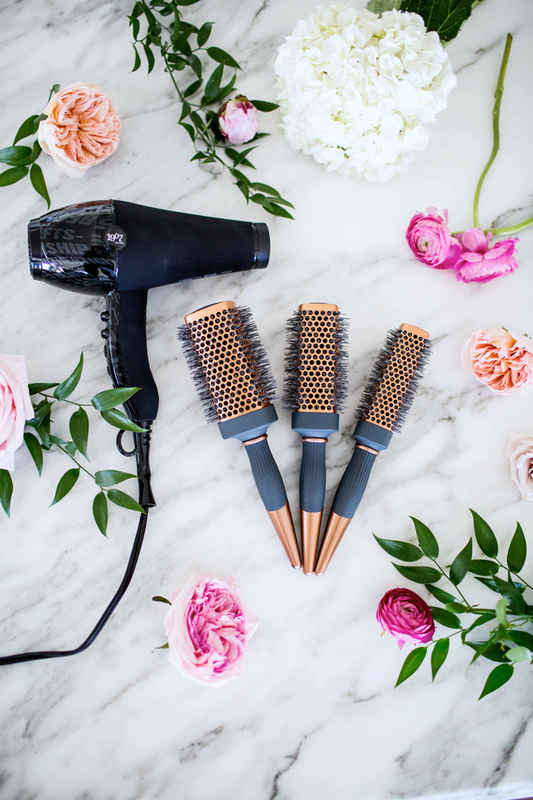 I am in the need of a new hair dryer and brushes so I will looking into these for sure!! Love this post! Looks like some great brushes! I love your hair. Brushes make all the difference. Rachel, Your hair is getting so long! I am obsessed!! Your post yesterday was simply breathtaking! Congrats to your cute family. Thank you so much for the tutorial! I am always so envious of your gorgeous locks, it’s wonderful to be able to recreate your styles at home! I’m just now getting into the swing of giving myself a blow out, so any information I can find is helpful. I’m always on a hunt for new round brushes. Looks like I need to try this one out! You certainly have the best hair! Thanks for the tips. That robe is beyond gorgeous! I’m on hunt for these brushes! I do not know how you keep your long hair so healthy looking. Mine is long but so straggly. Also, how do you get your photos to look so bright? Do tell! Your hair always looks flawless, thanks for sharing! Your robe is so pretty! You have such beautiful hair! Thanks for sharing! 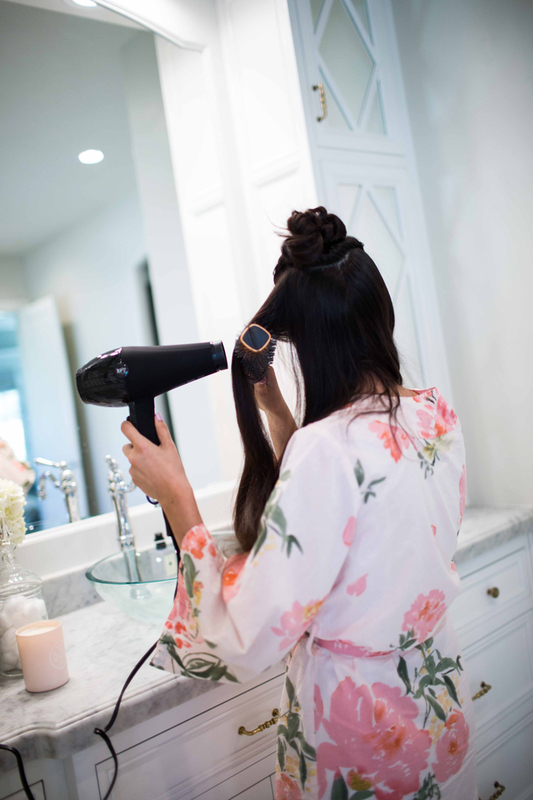 Love these pictures and have always been curious about how you do your hair! The brushes are really nice and they look like they work well with thick hair too. You’ve definitely perfected your wavy curls, and these pictures make me wish I never cut my hair! Love it! Gotta try Rach inspired hair sometime! Awesome tutorial… love your hair, it’s so pretty and long!! 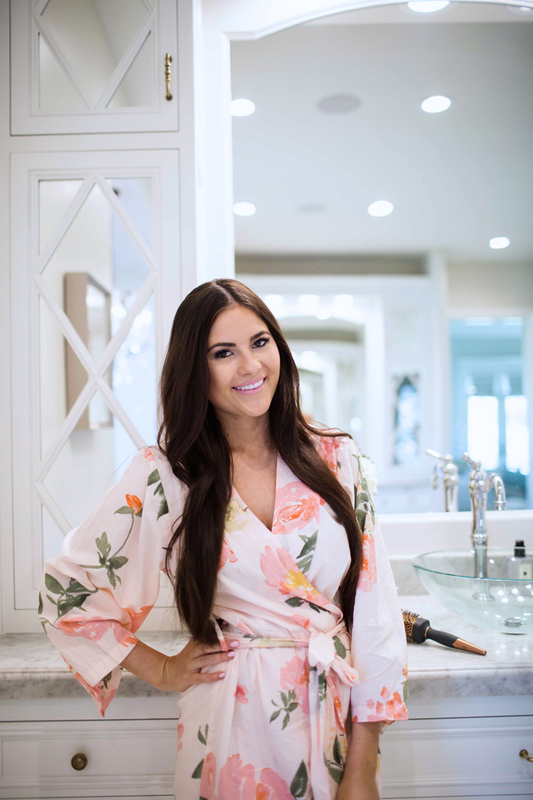 Also adore your robe and bathroom… so pretty! 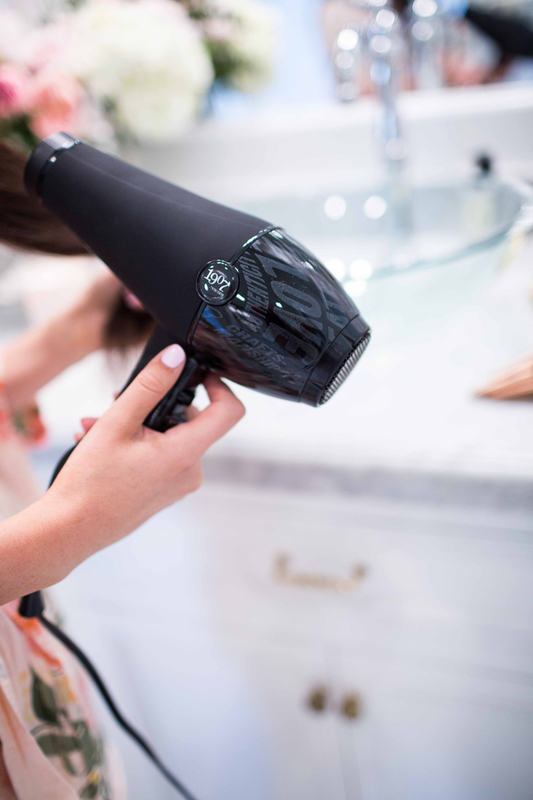 I just bought a new blow dryer, risk speed freak from Ulta and it comes with a nozel that is awesome to use with professional brushes! Does this dryer come with a nozel? Do you feel like it cuts your dry time? I have long hair too so that’s why I ask! !